Our Coconut Shy is a great traditional game for your guests to enjoy. Complete with wooden balls we would ask that you provide the coconuts. We will supply the basket for them. This set includes 6 wooden balls, coconut stand and hessian back posts. You can opt in for the hay bales at for a small additional fee. 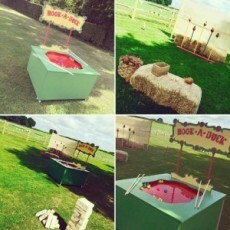 This works great combined with our Hook a Duck game, get in touch and we can create a special games package for you.